Castle_3x02_He's Dead, She's Dead_Promo pics. . HD Wallpaper and background images in the замок & Beckett club tagged: caskett he's dead she's dead season 3 episode 2 3x02 kate beckett richard castle castle & beckett nathan fillion stana katic. 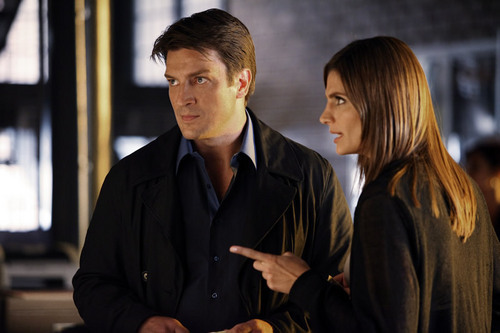 This замок & Beckett photo contains деловой костюм. There might also be хорошо одетый человек, костюм, брючный костюм, and костюм брюки брючный костюм.